Adidas has, again, raised the bar in their fight to be top-dog in the elite world of soccer cleats, by releasing a completely new and advanced type of power boot; the Adidas Predator X. With just 8 months until the beginning of the 2010 World Cup in South Africa, Adidas have unleashed a cracker of a boot on to the market! Over the past few months, Nike has been releasing new cleats left, right and center, while Adidas has simply kept their cards close to their chest. Well, no longer! The Adidas Predator X is now available for all to wear. Thanks to the folks over at soccer.com, we have been lucky enough to be testing a pair for the past few weeks, in games and in practices, in order to bring you the most in-depth review right as the cleats are released. First off, let me just say that I have never been a big Predator fan. Growing up, I was the one who avoided the Predator range, as they always seemed a little too gimmicky for me. On top of that, I see myself as more of an Andrei Kanchelskis than a David Beckham, so I have always looked for the lighter boot that is advertised for speed and acceleration. These cleats are a little different, and I must admit, I am a big fan of what they have to offer. I wear a size 9 soccer cleat, and for this review I wore a 9. Size wise, the Predator X fits true to form. I was wearing the White/Dark Brown/Yellow version. Visually, they have a ‘whoah’ effect, testament to the fact that anyone who has seen them really likes how they look. They have a sleek attractive look about them that makes them very appealing. There is plenty of yellow in the design, but this actually looks really good. It is the simple things like the yellow area where ‘Adidas’ is embroidered into the cleat that make it look good. I am also a fan of the ‘Predator’ logo that is embedded in the ‘Predator Zone’. From the first day of testing, the cleats felt comfortable. Breaking them in was pretty easy, and thankfully, I did not encounter any blistering. Having the right size is obviously crucial, and from my experience, there were no pressure points where the cleat rubbed. One thing I noticed (and I am not sure if this is a design that Adidas added) was that the inside heel has a series of ridges or lines. They are very small, but they definitely help with keeping your heal gripped to the cleat and I personally think that this will reduce in first wear blisters on the heal. After 3 games and several practices, I still have no comfort issues to report. One of Adidas’ developments on this cleat is a new upper material called ‘Taurus’. You can tell that quality materials are used in this cleat by the feel of the full-grain calf leather. Along with its super-soft, lightweight properties, you also get the added bonus of weatherproofing. One thing that is very noticeable about the cleat is how thin the material feels. Adidas maintains that this allows for a barefoot feeling when touching the ball, and I tend to agree with that. On passing the ball, it feels super close to your foot, but you are not losing protection. On the inside of the cleats and along the tongue, you will see the word ‘Optifit’ printed, and this is the technology that allows for this. Another aspect to the design that I really like is how they have removed the tongue, leaving an extra snug fit when you tighten the laces. This is new to the Predator range, and for sees Adidas move towards an adiPURE style design. The lacing system is asymmetrical allowing for a larger strike zone. What really separates this version of the Predator from its predecessors is the new ‘Predator Zone’. In this version, the strike area is covered with ridges of bubbled silicon. One thing I have not liked about previous versions of the Predator is the area covered by the actual ‘Predator zone’, but on this version it seems to cover exactly the area that is needed. This area is designed to help with swerve, control, and accuracy. And there definitely is some benefit to the technology. If anything, it will help you focus mentally on striking the ball as you intend. I spent some time taking corners and free kicks, and it did seem easier to place swerve on the ball. I was pretty impressed with the amount of whip that I could get on the ball. There are two negative sides to the release. In my opinion, they are again priced a little high. I think this would have been an ideal opportunity for Adidas to give back to its legion of fans by lowering the cost. The second thing that I don’t like is the fact that Adidas have not found a way to decrease the weight of the boot. Seeing as they removed the tungsten elements (and all the other gimmicky insoles they have had in the past) I thought this boot could have weighed somewhere around the 10oz mark, instead they are a modest 11.2oz. Adidas need to address this on the next release in order to stay competitive with the likes of Nike. To sum up, I have to say that not only is the Adidas Predator X my choice for ‘Surprise cleat of the year’, but it will also fall into the ‘Best Release of 2009’ category! Not only do these cleats look good, but they also offer great comfort and quality. In terms of who they suit, I have to say the options are pretty open! From Goalkeepers to strikers, I am sure that all types of players will be wearing them. David Beckham has been the center piece of Adidas Predator releases in the past, and this new version will be no different. Even though much has been said about Beckham’s decision to play in the US with LA Galaxy, he is still a high class player and one of the best free-kick specialists in the wall. Expect to see the plenty of highlights while he is wearing the Predator X! If you are looking to be one of the first wearing a pair, find them at soccer.com. Did you know that a player from club APOEL, who played against Porto at the UCL last week , has worn the Predator X just before it released? I am planning to buy a soccer shoe but I don't know which one to choose. Which one would you recommend, based on performance (not by their looks) Adidas Predator X or Adipure 2? If posible, please state the reason. I love to play as a midfielder and sometimes I go upfront to take long shots. I'm looking for shoes that can give me a lot of power, accuracy in shots and passes and swerve. I'm not looking for fast shoes. If you have other shoes (other than Predator X and Adipure 2) in mind that can satisfies my needs, please tell me. If you can, please state the reason. Anyone knows the price of Adipure II and Predator X in Ringgit Malaysia (Malaysia's currency)? Thanks in advance!!! Nice site. Predators mate!! I got some for christmas and they are brilliant. Highly reccommended mate. i was wondering if these need leather food or not to maintain. why did u give it only a seven for durability? After a few weeks, the front started to scuff. It looks as if there was polish on the cleat, and it was scraped off. This is probably due to the fact that a full grain calf leather is used instead of K-Leather. It doesn't look good, so I feel like it is only a 7 in that category! i wonder bout my shoe's size…i bought predator x us size 9 but it doesnt fit very well..seems like a bit bigger…should i change to size 8 1/2 or just wear the shoe? Wow, Bryan, I completely agree with everything you said here. 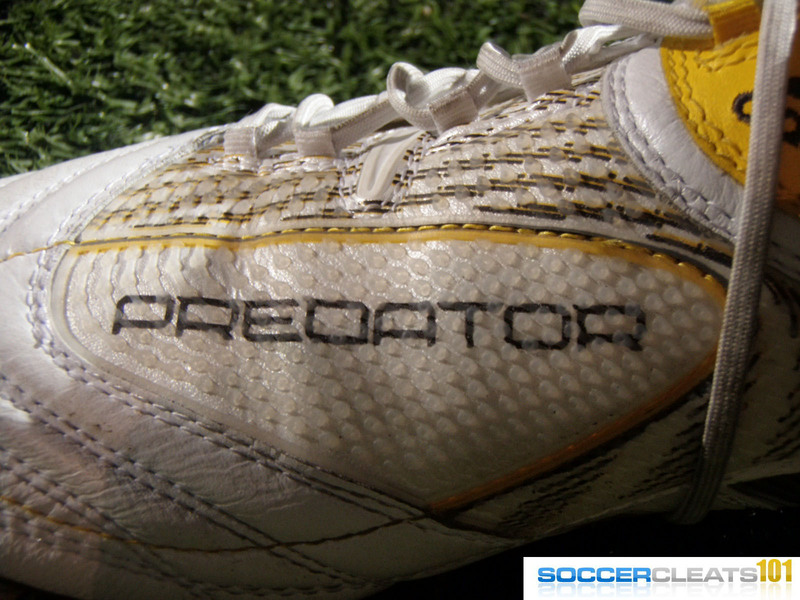 I just posted up a review of the Predator X’s on my site: http://www.reviewsoccer.com/cleats/adidas-predator-x-review. My review pretty much agrees with yours. Have you heard about adidas adizero? its supose to be a resppnse to the superfly 2 that is coming out…when they come out (the adizeros that is) can you give them a reveiw 2? We are awaiting a shipment of the adizero's, they are due for release after the Superfly II is released on the market…Adidas will be pushing them right before the World Cup…stay tuned for more info and a review! I just bought the Predator X beckhams, used chelsea leather food on them, not a very good idea. did not help whatsoever. after 3 hours of playing the front of leather actually started pealing up from the sole of the cleat. had to get them replaced. i m from Fiji, yesterday i bought the Adidas Predator X, its really good. when i tried these on in the store there was a bit of space around my toes? they were the fine length around my big toe just my others ones had extra space do these form around you feet after a while or does it stay the same? in retrospect, if you choose preds over any nike cleats… you feel that your buying your money's worth IMO. nikes look great but seem flimsy in comparison. I recently purchased the Predator X's and am having a hard time breaking them in. They are causing blisters all over my feet. The top of both pinky toes and on my outside heel in particular. Both spots are directly caused by the synthetic parts of the boot. The edge of the plastic heel and where the plastic ends for the three stripes. I'm hoping they will break in soon as I've only worn them for about an hour and a half until now…mainly because I can't wear them for more than half an hour at a time due to the blistering. Having said that, I hope they break in well because the Powerspine is definitely not a gimmick. I find that even when I don't hit the ball flush I get more power on my shots. Also, the swerve I get when crossing and shooting is more pronounced wearing these cleats. I hope this review is helpful for you guys, I will post another one after getting a few hows in them and let you know if they break in. Does adidas also sell the adidas predator X insole ? Hey Bryan, Im looking for a good durable boot. 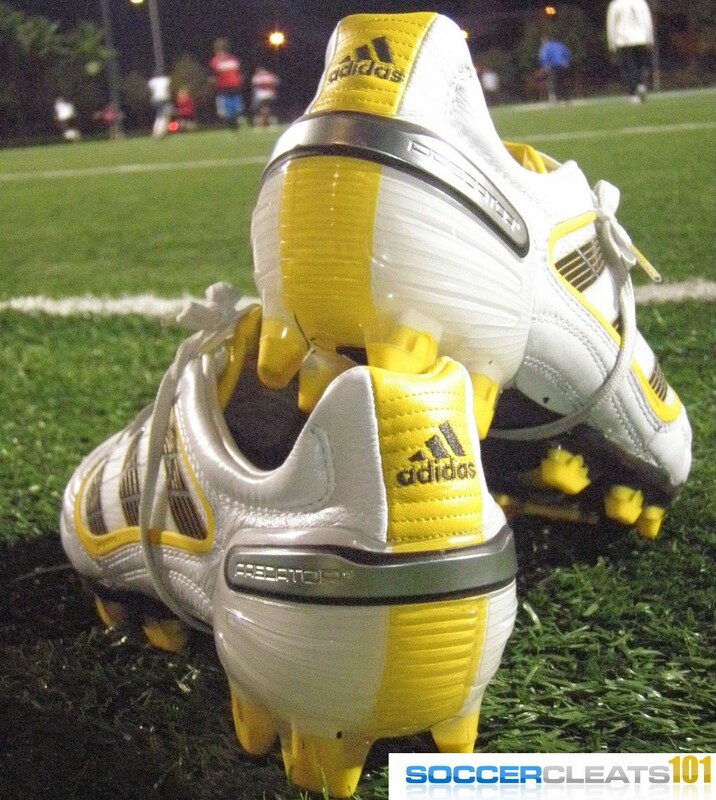 Im in the middle of deciding to get either the Leather adiZeros or the Predators. I don't want to spend alot of money on a boot that won't last that long. Which boot do you think will last longer? I have read both reviews and still can't decide. I am a goalkeeper also. Thanks Sam. You say boot of the year, and you post 91/100, whilst in adiPURE III you say hey rank 92/100… I don't get it. I stated that it falls into the category of best cleat of the year, I didn't say it was cleat of the year! These are going to be more durable than the adizero. I definitely appreciate the importance of getting a boot that lasts longer at current prices. Plus, you get the bonus of the Predator zone for striking the ball from kickouts, and as a goalkeeper that is important. I am having problems breaking my preds! I'm getting blisters on top of my pinky toes on both feet. I have tried the Vaseline route and walking around the house with them, but the pressure points are still there. Do you have any tips? Thanks. Sounds like they might be a little too tight, it is best to take some time breaking them in through jogging before wearing them in a game. Shower in them (hot water), this will help stretch the leather. Take your time with them! Thanks Bryan; sorry for misspelling your name on the previous message. Excellent.used them first time and scored 4 goals.brilliant stuff. I had a pair of ctr360 libretto and they are falling apart! They scuffs pretty often too, but for a striker (i'm the goal-poacher type) is the predator x a stepup than the ctr360? And is the control as good as the ctr360? Last but not least, i noticed the instep design for the predator x , does it deliver anything? Has anyone encountered any pain from the powerspine like I did? i've tested these extensively for the past two months. the powerspine actually enables you to head the ball twice as hard and 3 times as accurate as compared to normal boots. I bought these cleats earlier this week. I've been using the Powerswerves for some time and really see some improvements in this new version. The Powerspine is awesome! Your shots feel more solid and the ball goes harder. I think it also helps the overall stability of the cleat. I'm loving these cleats alot! The only bummer is the break in process, it is not as fast/easy as in the old PS cleats. Try using a thinner insole. In my case the cleats felt really tight (the lenght was ok). I changed the insoles and used some old ones that were thinner and it made a night and day difference, these cleats now feel perfect! Much more space in the mid foot and metatarsal area. I haven't used these thinner insoles in games or practices, just around the house fooling around trying to break in the cleats. I don't know how the impactof running/playing in such a thin insole will affect the feet. I read this cleat review and I don't think you said much about the "power spine". Would you agree that it serves it's purpose to the shoe? Did you ever feel like your shots were more powerful when wearing these cleats, than when wearing normal cleats? Hey bryan, do you recomend to buy these or vapor vi .since i play either as a striker or on the wing . It depends on your style, if you are of the Beckham mold (like to cross) go with the Pred X, if you prefer to run at defenders the Vapor VI would be a better option. 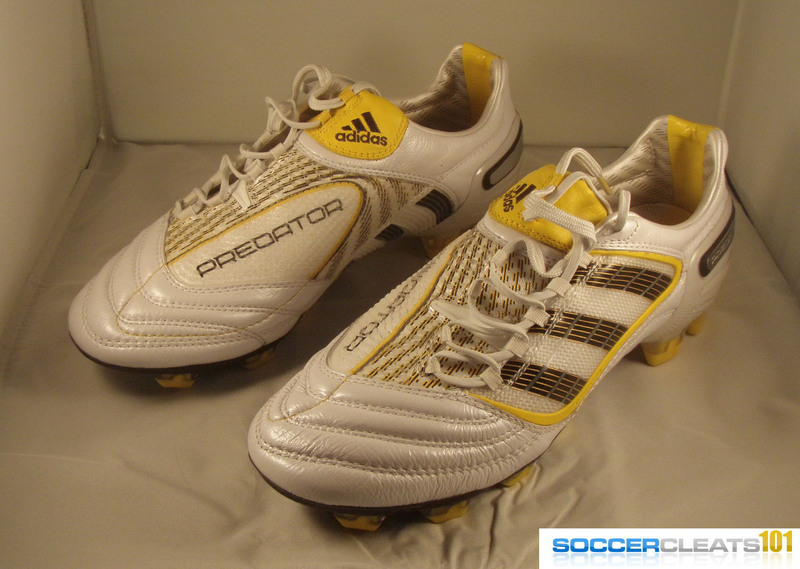 I'm thinking about getting the Predator X UCL boots but I'm also looking at the Adipure III 's. Which would be better????? hey ikno there are quite a few differences between the predators and the cheaper versions like the preditos but how does it affect things like comfort and performance. i wuld appreciate an answer thnks in advance. Do you know if the predator kinect's will be coming out sometime in march?? I have already decided on some CTR's but odnt know what other cleat to get?? i play center back, any suggestions??? how come durability is @ 7? Hey Bryan, I was wondering if you could give me an opinion, I want a boot that will offer some really hard shots with some comfort and touch but cant decide between the Adipure 3 or 4's, vapor line (including superfly 3's), Laser Elites or Pred x's. What is your first and second opinion? Thanks. For power, go with the Laser or Predator range. Right now, you are going to get better deals on the Pred X since the latest version has been released – so they are my recommendation!